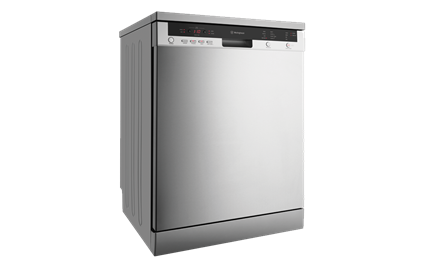 Stainless steel freestanding dishwasher is rated 4.3 out of 5 by 156. 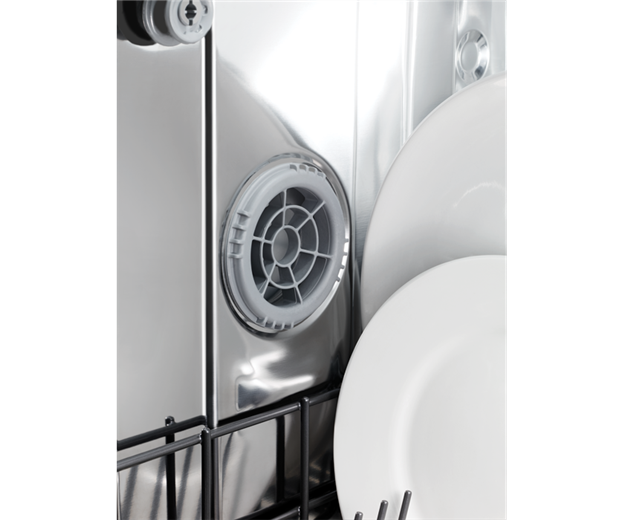 The Freestanding Dishwasher has 8 flexible wash programs, an added cutlery tray and convenient delay and drying results to ensure you a worry-free clean! 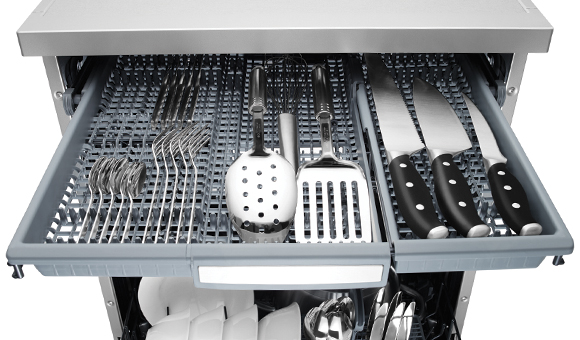 Not only does our flexible cutlery tray wash all your utensils effectively, it can also safely fit long knives and other larger items. This helps to prevent injuries from steak and chopping knives, while also providing the convenience of a designated place for those bigger utensils. 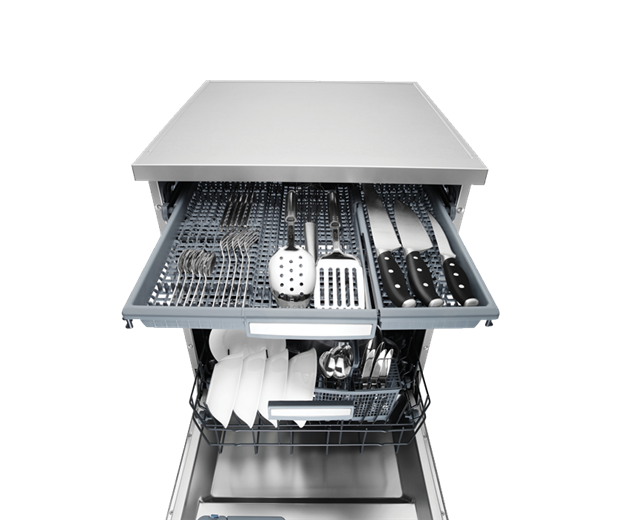 Created to suit your ever-changing needs, the cutlery tray can also be removed partially or taken out all together to fit taller items. 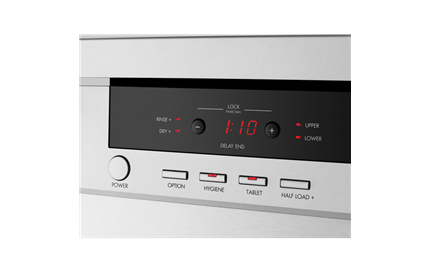 Rated 4 out of 5 by KirstyH from Great machine but a few quirks you need to know I purchased this dishwasher to replace our Bosch on recommendation from our Applicance Repair Guy as they are best value for money and dont have the E24 pump issue that Bosch has. 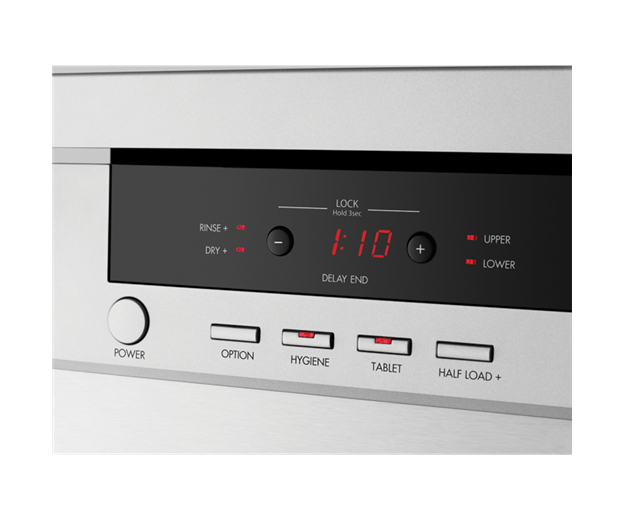 I preferred the 6608X with the cutlery tray as I loved this about our Bosch. To ensure large dinner plates fit in the bottom tray you need to lift the blue/gray arms of the cup tray which will raise the cup tray about 2 inches and large plates will fit. Any large glasses need to go in the bottom tray. This machine is all about loading correctly. 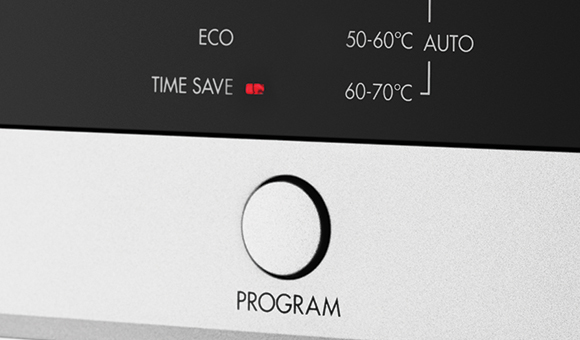 You also need to know which programs have a dry setting. Excellent machine once you know the quirks! Rated 5 out of 5 by Ricca 64 from Great Features! I bought this dishwasher about a month ago and absolutely love it! Its so quiet you forget that it is on & the dishes have come out sparkling clean every time. The time save feature & the half wash load functions are very useful options to have.I am also very surprised with the amount of dishes I am able to fit in & the cutlery tray is also a very useful feature to have. I also received the "6 months of free finish tablets" promotion which was a bonus! I had a LG which lasted for 6 years until the pump went, which did the job but no where as good as this dishwasher. I would highly recommend this dishwasher to anyone. 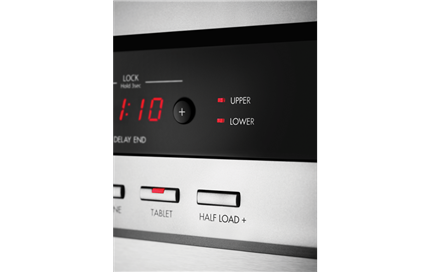 Rated 4 out of 5 by Kev1 from We have now had this dishwasher for over 12mths and it has performed flawlessly. It's extremely quite and has good strong cleaning ability. The "drying" feature works surprisingly well on everything except plastics, which are near impossible to dry in any dishwasher. The only draw back with this model is the slide out top cutlery draw. When this is used it becomes a battle with which other shelf looses space, it becomes a choice between no large glasses/cups in the top or no standard size dinner plates in the bottom. Luckily it comes with a traditional style cutlery hold wich we now use. 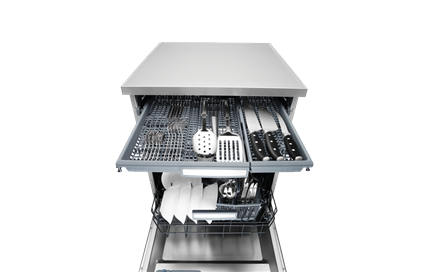 Overall plenty of features and washing ability, but not enough space for all three shelves. Rated 5 out of 5 by mezze82 from Highly recommend I bought this machine for my mum who replaced her old simpson, and she hasnt stopped raving about it. She says that her big pots fit in there well cause she can fold down the racks, and the loves the cutlery tray because she can fit all her large utensils up there without sacrificing space. it looks really good in her kitchen too. Will be buying one for myself when i build my kitchen. Rated 5 out of 5 by Paulette from Still Super Happy! 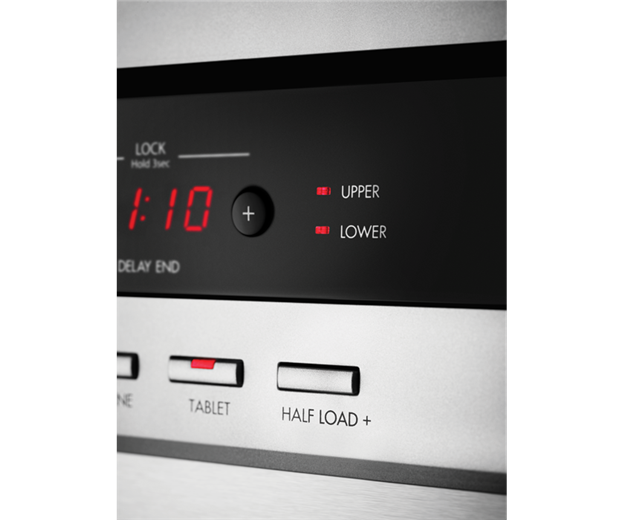 After three, maybe four years, we are still super happy with this dishwasher. We "quizzed" a couple of salespeople on different days and they both came up trumps. 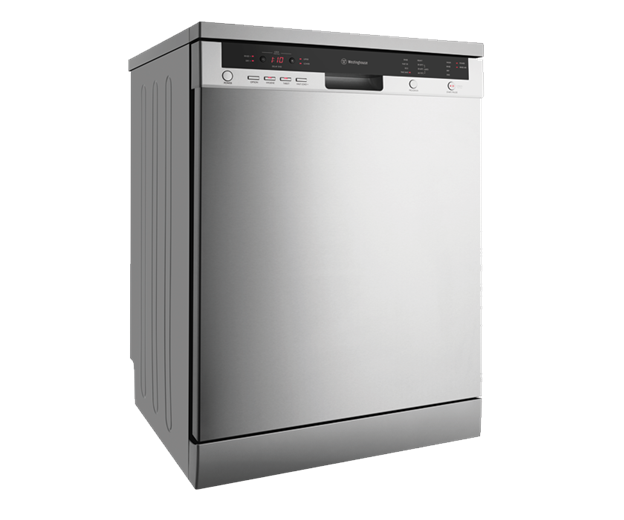 Can't believe we waited so long with our previous dishwasher before changing! This is a heavenly machine.... 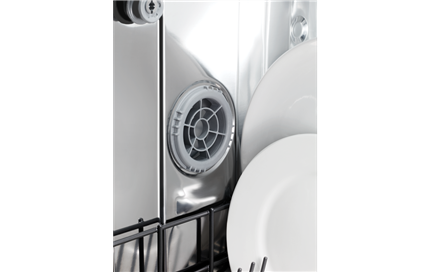 It hasn't missed a beat, delivers clean, dry dishes every time - we always rinse (old habits) and stack only one level on the mid section. We stack large dishes on the front right hand side away from the swing arm which gives unrestricted spray flow. When we move in the next year, we will be taking this baby with us for sure! Rated 2 out of 5 by Caroljkiwi from Disappointing We went with this dishwasher because of reviews on Consumer but are disappointed with it because: I have to check every dish after each wash as at least one wiill have bits left on it. We are now pre-rinsing dishes to almost clean before putting them in. We have normal size plates but to fit them in the bottom tray we have to raise the top (dishes) tray. When we do this only small glasses will fit in the top tray and the ones that no longer fit in there fill up the lower tray. Somehow the desert dishes don't stack properly in the holders, I'm finding I have to space them 2 holders apart to get them to sit together. I like the cultery tray but my fish slice and spoons don't fit in there like in the pics here, I have to put them in the top dishes tray. Rated 4 out of 5 by Marilyn from Love this Dishwasher the first thing I want to say is how quiet it is. I do not agree with previous post. We can get our large dinner plates in the bottom with out moving the top shelf up. You must have xtra large plates. I do agree about the cereal bowls not having any where wide to fit each one in. Apart from the cutlery drawer at the top, it also has a cutlery basket on the bottom shelf, as previous models do. 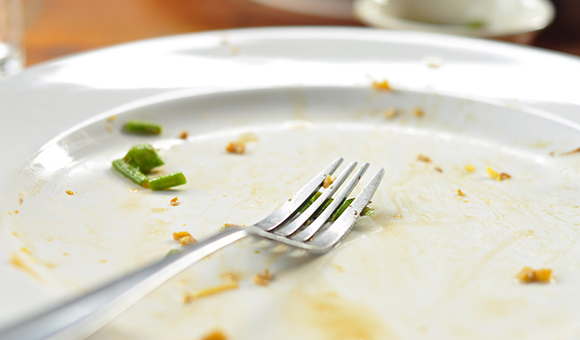 I have always washed the food of the plates with cold water before entering them to a dishwasher, as it saves cleaning out the filters.